Mackerel get a lot of bad press. ‘Proper’ anglers don’t want the stigma of catching them or being associated with lines of holidaymakers banging out strings of feathers to catch a fish to feed the cat. Some see those summer feathering hoards thronging the nation’s piers as a threat to angling’s very existence, as well as jeopardising access to many favourite sea fishing venues. However, once you step around the appalling behaviour of a few people you come face to face with a fish that is a bit special in terms of angling enjoyment. The mackerel is Britain’s only real tropical inshore species, a close relative of the tuna and a true member of this speedster family. If they grew to 10lb, instead of an average 10oz, then we would have to use special tackle to tame them. Even so, fished for with light gear, lure or float, a mackerel can put up a lively scrap, although its reputation is marred by the fact that it is also a sucker for multi-lure rigs worked with minimal skill. Having said that, thousands of would-be anglers are introduced to the sport because of the mackerel’s availability and ease of capture. 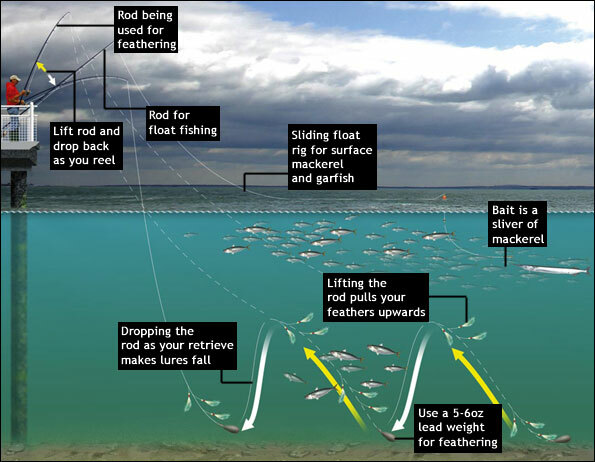 Indeed, a cheap rod and reel costing under £50 will get you fishing, especially from piers where mackerel shoal up and can be captured fairly easily. The step up from mackerel to proper sea angling may be a major one, but feathering with a string of lures is a fun pastime that is enjoyed by thousands every summer around our coast. Common all around the British Isles during midsummer, the mackerel is a shoal fish that shows in large numbers on the surface when it is feeding on the small baitfish, mainly whitebait, that it chases and corners along many tidal pier walls and groynes. Feeding mackerel get into a frenzy and are oblivious to lures, snatching at anything that moves in their competition to eat. Originally a few chicken feathers tied to a hook were all you needed, but now a range of more elaborate synthetic lures are available. Their distribution is affected by sea temperature and weather, so that the far northern regions of the UK have their mackerel season in mid and late summer, whereas in the south, mackerel are offshore for most of the year, moving inshore and northwards in spring. Feathers: White or mixed coloured feathers are still available and popular because they are the cheapest around. Hokkais: These have a small luminous fish head design with glitter/tinsel and feather streamers. In small sizes, they are really deadly for mackerel and for use as baited lures. Sabiki: Amini lure that is superb for catching the smaller baitfish like sandeels, launce, herrings, joey mackerel and scad. Amust-have during summer for catching bait, but cast with care because they are fished off light line. Silver tinsel: Atried-and-tested favourite. Made with silver tinsel with a red whipping around the hook spade, they tend to fall to pieces with use but then they seem even more deadly. Shrimp: Several companies produce shrimp patterns in large, standard and mini sizes, with the latter considered especially effective for mackerel. Daylights: Another favourite, these are made from silver or white reflective materials with a full-length coloured whipping on the hook shank, one of the toughest of the mackerel lures. 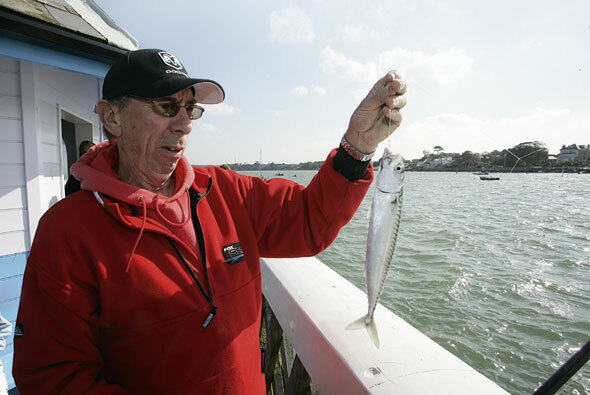 Some days mackerel turn their noses up at a string of feathered lures, and this could be the time to try a small bar spinner or even cast a fly. At other times fishing a single fish bait under a float really works. It’s the same tactic for catching garfish and is the most sporting and enjoyable way to catch mackerel. However, don’t try it from a crowded pier because you need plenty of space to make it work. Drifting a float in the tide allows the bait to cover a larger area of sea, so fishing away from those that want to feather or bottom fish makes good sense. The depth at which you fish the bait is crucial, and a sliding cigar-shaped float with the line going through the centre is the best because you can add a stop knot to the line above the float to fix and adjust the depth. When you retrieve the line, the bait is stopped and lifted towards the surface by the float. It’s a deadly tactic that can be used regularly as you drift the float and bait back into the tide. Another method from the beach involves the split rig. This is a long rig that positions the baits high in the water with the aid of pop-up or floating beads. Clip on a set of three lures and cast and retrieve sink-and-draw style from most piers or deepwater beaches from May to September. The technique is to cast the lures and allowi them sink to the depth required, and then retrieve them through the water. Sink and draw involves lifting the rod and then reeling as it is lowered, producing continual movement of the lures, which the mackerel seem unable to ignore. From many venues the depth at which the fish are feeding is the key to catching. If they are shoaling on the surface don’t let the lures sink too deep, and retrieve them more quickly. If the fish are not showing, allow the lures to reach the bottom and retrieve more slowly. It is easy to change the depth the lures are fished at sing the sink-and-draw method, explained in our accompanying diagram. The method is so popular on many venues that they are crowded at weekends, especially at high tide when the fishing is usually best. Top catches are made in clear, calm water. Mackerel don’t like heavily coloured water and are not found in the siltiest estuary regions. Most of the feathers are produced in the Far East by non-anglers, so the knots, line strength and clips are not always suitable for our power casting styles with a 5oz or 6oz lead weight. 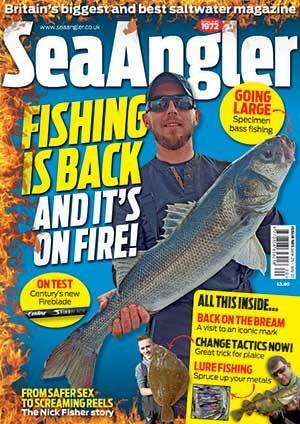 So take care that your cast doesn’t overload the rig, snapping the line or pulling knots and lead links open. Look for rigs made with 40lb-plus mainline. 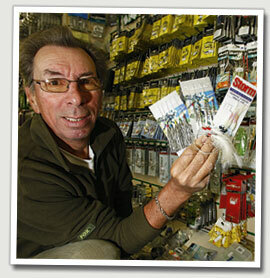 The small Sabiki lures are generally made in light line, so take special care casting them. If in doubt about the strength of the mainline, reconstruct them using 50lb trace body line. From a safety point of view, scrap the original top swivel and lead link and replace with stronger components. Use a heavy lead weight to catch mackerel in deep water because it adds fizz to the lures as they sink. Amistake many anglers make is to fish with a light 2oz to 4oz sinker in an effort to make feathering more sporting, but a light lead does not sink the lures quickly enough.